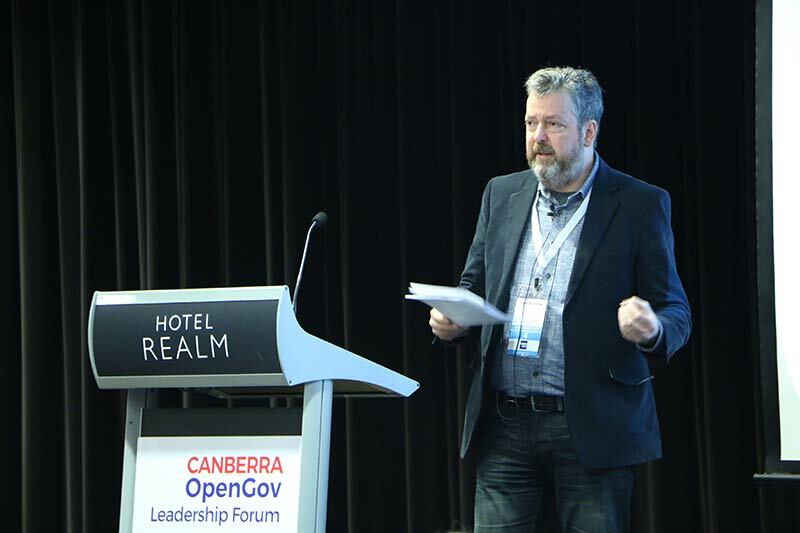 Mr. Tim Occleshaw, Government Chief Technology Officer, Department of Internal Affairs (DIA), New Zealand (NZ), delivered a keynote address at the Canberra OpenGov Leadership Forum 2017 on July 13. He talked about the digital government journey in NZ and shares the vision for the future. (Read our recent interview with Mr. Occleshaw here). Good morning everyone. It’s great to be here to share a bit of New Zealand’s digital story. Before I do that, I’ll start with a bit of context. Unlike the UK, USA, Australia, Canada or many other countries, New Zealand doesn’t have state or provincial governments. Our system only has two tiers, and most of government’s service delivery is done at the national level. Also, unlike the UK, Australia and others, we don’t have a standalone digital agency. What we have is central leadership through a Government Chief Information Officer (soon to become GCDO) leading the transformation of government’s systems and services, with collaborative delivery through public service agencies. And more crucially, we don’t have a big budget to implement digital transformation across the sector. So, creativity, innovation and collaboration are even more important, especially given the public’s expectation for everything digital is growing exponentially. I’m sure this is familiar to you all! The challenge for all of us, I think, is to re-imagine our services and processes. This isn’t about just putting in new technology! It’s more about a cultural and social change. And the potential benefits for our society and economies are huge. Less than five years ago, when we launched our first Government ICT Strategy, (which should really be called digital strategy because it’s about digital services, information and the technology) government agencies did their own thing – in architecture and strategy, procuring, building, running ICT, the way we managed security, privacy and risk. Those last two things have so far delivered $107m per annum in savings. We have changed the way our government plans and invests in ICT, made it easier and more efficient for agencies. I believe we’ve been successful because we’ve taken a collaborative approach. We work side-by-side with agencies, rather than sitting on the sidelines issuing instructions. We work with agencies as they develop their strategies, investment plans, Cabinet papers, and we’re usually with them when they go to Cabinet for approval. One example of this is Land Information NZ and their Survey and Titles system. This started as a potential $100m bespoke system build (you could imagine Ministers’ reaction!) and has become moving their core line of business to an ‘as-a-service’ model. We’ve helped them develop the strategy and through the investment and commercial conversations, instead of building a system, they’ll use a commercial as-a-service system funded by the fees they charge their customers. This partnership approach has certainly been a successful strategy for us, but it’s also one of the areas where more could now be done. Agencies are encouraged to adhere to government’s enterprise architecture and standards, but they are not compelled to. We rely on goodwill and relationships and there’s a significant cost (time and effort) that goes into it. The key to our collaborative approach is a mechanism we call the Partnership Framework (soon to be renamed Digital Government Partnership) – made up of 60 senior people from 21 agencies led by 12 CEs from the larger agencies. It drives the strategy and digital agenda for the government. The Partnership has been extremely helpful in achieving a more coherent cross-system view, getting greater agency buy-in, and leveraging resources from across the system. I’d say it’s one of our key differentiators from other nations that are now looking at what we’ve achieved and how we’ve done it. People are often surprised at the amount of interest we get from other countries. Over the past year we’ve had more than a dozen other nations come to talk to us about what we’re doing. New Zealand is a founding member, and currently the chair, of the D5 group of digitally advanced nations. Among other things, we’re currently leading the D5 work on digital identity for nations that don’t have a national unique identifier. In 2015 New Zealand was invited to chair the OECD e-Leaders group. And we’ve had recent interest from Fletcher School at Tufts University who see us as a ‘stand out nation’, and they’ll be doing a case study on our digital progress. Integrated services based on life events. And late last year, we launched SmartStart, our first integrated government digital service. It’s a cross-agency initiative that gives parents easy online access to information, services and support during pregnancy and baby’s first years. It’s had 100,000 visits since it was launched in December 2016. It also won at the IPANZ Public Sector Excellence Awards last week in the Achieving Collective Impact category. This recognition reflects the incredible amount of work put in by all the people and agencies involved with the project. Earlier this year we had a delegation from Singapore wanting to understand how we achieved the agency collaboration necessary for SmartStart. We’ve also had delegations from overseas wanting to know how we achieved the first (and still the only) fully online passport application system. This UN model is a helpful illustration. We’re on a journey towards a truly connected digital government. (‘Connected presence’). In this space, the way government operates fundamentally changes: there’s coherence, integration and coordination of processes and systems within and across government agencies, and beyond our traditional borders into a wider ecosystem. That’s where we’re going. In some areas we’re at the ‘Transactional presence’, but not uniformly. Although there are some special cases I’ll talk about soon. Basically, we’re now at a point where the barriers we face are more significant, so government needs to lift maturity and strengthen and accelerate its activities. Some of the roadblocks are now more prominent, such as the absence of funding models for cross-system initiatives and benefit models that focus on silos. But what do we mean by ‘digital’? allowing others to create value through use of APIs and machine-readable data – where government just needs to get out of the way! having foundational digital capabilities (e.g. digital identity, standards) that support an ecosystem. Digital transformation is not just about technology. It is about a cultural change; changing the ways we think and operate. To stay relevant we need to fundamentally re-imagine how we engage and serve our citizens, from the outside-in. Late last year, Inland Revenue went live with a new GST system – the first major tranche of big changes to New Zealand’s tax system. Now, NZ businesses can file and pay their GST each month directly through their accounting software. No paper, no web transaction, just a direct connection from their own ledger into IR’s system. This is real transformation, and it reduces friction and compliance costs significantly – for businesses and for IR. Our ultimate aim is to deliver better public services that are more like that. We’re looking for ways to make changes that have the greatest possible positive impact – this isn’t about better websites or more web transactions. The core idea is to move into a world where citizens, businesses and others can curate their own experience. Where businesses pay their tax seamlessly from their accounting system, where government publishes information in machine readable datasets, and APIs to allow others to create value. Government doesn’t do everything and doesn’t ‘own’ the experience. In fact, often we’ll be invisible; we’ll just be part of someone else’s supply chain. Enabling a different future than could not be achieved by simply tuning and tweaking the present. This means moving towards an ecosystem of services and information-sharing where government provides components for others – the private sector, third sector and communities: the people with the trusted relationships – to create and curate the services people want. Here’s another way to look at the ‘Connected Presence’ in that UN diagram. I use this to remind my colleagues and others that, while our role is significant, we’re not the only player. We’re part of something much bigger. But mostly, we’ve demonstrated the value of collaboration at all levels of decision making, design and delivery. So what’s next for NZ? I mentioned that our vision is for people to be able to curate their own experience (even if government is actually not directly visible). SmartStart is a good start, but let’s take it further: imagine a world where I can go to my favourite airline website, or travel app, or whatever future interface, and I can book my travel and authorise that system to check my passport expiry, my travel visa, check for outstanding parking fines (so I’m not stopped at the border), apply for what I need or make payments, and maybe note my health record that I’ll be out of the country. Government needs to be a driver of the digital ecosystem (and a node within it), but we don’t own it. Nations that embrace digital disruption anticipate challenges and barriers and tackle them in a strategic way are more likely to prosper. And those that have tried to resist, or to control everything, have not succeeded. As I’ve said earlier, this isn’t about technology – it’s a cultural change and a different way of thinking. Part of my work continues to be encouraging agencies to let go of traditional ways of working. Together with government agencies and our partners, we are building an increasingly integrated digital government ecosystem, leading the way for better outcomes for New Zealand and New Zealanders. D5 is a network of the world’s most advanced digital nations, with a shared goal of strengthening the digital economy. It was founded in London in late 2014 by the United Kingdom, Estonia, Israel, New Zealand and South Korea.